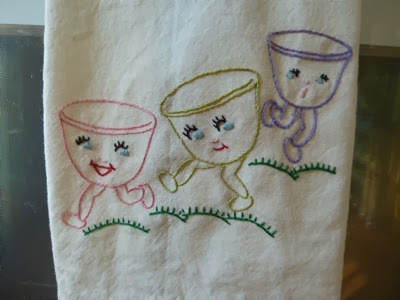 My Home and Garden: My finished embroidered tea towel. 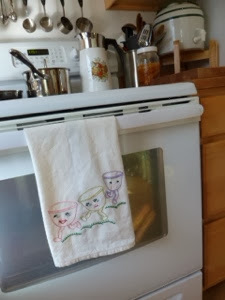 How cute does this tea towel look on my stove. Here are the promised pictures of the finished embroidery. As much fun as this is...I can't wait to get back in the garden. Hi SL. They still sell the transfers!! You take it, iron it on, and embroider it. The transfers are very reasonably priced as well. We import them and I think they are $2.99 and there are several designs in each pkg....and they can be used three times or so. Thank you Staci. The one I am doing now it a coffee cup and a cupcake. Very cute. This is so cute Erin! You'd make Grandma proud!